3dRudder announces new foot motion controller 3dRudder Blackhawk, including new ‘Active Dead Zone’ feature, new design with foot straps. Company will receive for three years in a row a CES Innovation Award and will unveil its new device for the first time during CES 2018. Straight from the Devs: January 4, 2018 (NEW YORK and AIX EN PROVENCE, FRANCE) – 3dRudder, an innovative technology company, leader in delivering solutions to virtual reality motion issues, announces today the 3dRudder Blackhawk, a new foot motion controller for PC Gaming and VR, to be honored with a ‘CES Innovation Award’ in the “Computer Accessories” product category and presented for the first time at CES 2018 in Las Vegas. The 3dRudder Blackhawk represents the next evolution in the product line and offers a newly redesigned device providing added functionalities. It fully really takes the space limitations out of the room-scale VR experience. Users control their motion intuitively with their feet while sitting, leaving the hands free to grab hand controllers and maximize the immersion while playing games. New ‘Active Dead Zone’ feature adjusts automatically reactivity and stability depending on the movement direction and speed of the user. In a device like the 3dRudder, the dead zone in a 2-dimensional plan (horizontal movements) is like a circle of stability. In a 3-dimensional space, it’s like a sphere of stability. In VR, you need stability when you stay still. 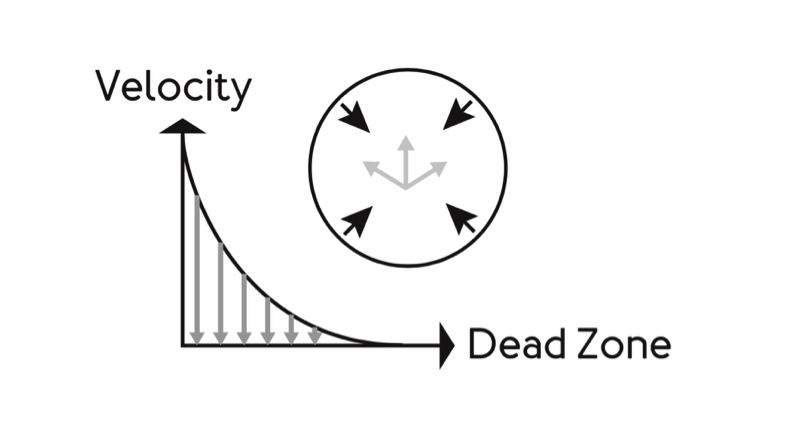 But when the action heats up, when you move and change directions quickly, you need reactivity: the more intense the action, the lower the dead zone. The ‘Active Dead Zone’ will be addressable as well by game developers directly from their games. New design includes leds and foot straps bindings. The blue leds are visually indicating the state of the 3dRudder also providing an aerial and futuristic shape to the device. The foot straps bindings are designed to help users in gaining the most precise control in their movement. When the game gets tensed especially with fast-paced FPS’, some players tended to inadvertently let their feet slide away from the 3dRudder. With the new design, it’s no longer the case and the overall experience is greatly enhanced. Gamers can also now better take advantage of the revolutionary 4th vertical axis provided by the 3dRudder. Foot straps can be adjusted and snap in and out of the device at their convenience. 3dRudder is also introducing two foot kits to let users of the existing device upgrade it, should they choose to do so. The Foot Guides kit includes 2 bases to be fixed at the top of each existing pad and 2 guides to be plugged into the bases. The Foot Straps kit contains the 3dRudder Blackhawk wings to be plugged on the device. Both kits are interchangeable at the user’s convenience. For developers: supported game engines are Unity 3D, Unreal Engine 4, Xenko, Stingray and OpenSpace3D; supported program tools are SKD C++, C# and Python. Pricing: 3dRudder Blackhawk will ship for $139/€139 starting Spring 2018; 3dRudder Original now ships for $99/€99; Foot guide kit ships for $24/€24 and Foot straps kit ships for $19/€19, and will be available from February 2018 on the company website at www.3drudder.com. Products entered in the program are judged by a preeminent panel of independent industrial designers, independent engineers and members of the trade media to honor outstanding design and engineering in cutting edge consumer electronics products across 28 product categories. The prestigious CES Innovation Awards are sponsored by the Consumer Technology Association (CTA)™, owner and producer of CES 2018, the global gathering place for all who thrive on the business of consumer technologies, and have been recognizing achievements in product design and engineering since 1976. What to expect and discover on 3dRudder booth at CES 2018 ? 3dRudder was founded in 2014 and has an office in Aix en Provence, France and New York, USA. The flagship product of the same name, 3dRudder, is a foot-powered movement controller, providing the most natural way to move in a 360° VR environment. For gamers, designers, architects, and professionals who want to do more in their 3D digital environments, 3dRudder keeps your hands free and enables total immersion in a virtual reality. CES Innovation Award Honorees three years in a row since 2016, 3dRudder is poised to establish the new grounds of Virtual Reality movement and control.